The Flirc Raspberry Pi case was designed to not only be functional for your Raspberry Pi, but to be drop dead gorgeous with built in heatsink. Spice up your Flick Large board with a stylish white and orange Flick Large case! Spice up your Flick HAT and Raspberry Pi with a stylish white and orange Flick HAT case! A slot over cover, which fits over the Pi, enclosing it, but leaving all ports like the GPIO free for hacking. A cover piece, which clips in and protects the Pi from dust and exposure. This case also features two slots for holding the Raspberry Pi Camera module! The Modular Case is compatible with a range of customisable modular features (sold seperately) including optional optical window, stackable 10mm spacer plates, microSD card cover, dual-use USB & HDMI security shroud, secure screw locking, VESA adaptors and internal SD card holder. Tall enough to host a wide range of add-on board and slim enough to look cool, the HighPi case sets a new standard for ease of use and versatility. It's just a fraction of an inch taller than most of the “standard” cases, but designed to perfectly host many add-on boards like all 3 the HiFiBerry boards. The HighPi is designed and made in Canada from high quality ABS material. Whether you’re running a plain Raspberry Pi board or modding it to the max, the HighPi case has your Pi covered. Generous internal room allows HATs, break-out boards, or heat sinks. Vents on three sides double as fly-through cable ports for the GPIO and whatever else you need to connect to. A two-section break-out allows you to choose how much of the A/V side of the case to open up for connectors on attached boards. Please Note: Raspberry Pi and camera not included. This VESA-Pi+ allows you to attach a Raspberry Pi computer to the back of most 75mm & 100mm HDMI monitors! Its low profile, sleek design is tamperproof and features black sides with clear top and bottom for some added zing! 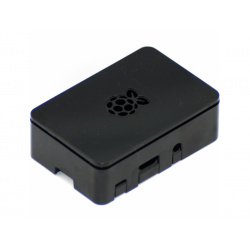 This case is compatible with the Raspberry Pi models B+,2 and 3. The VESA-Pi+ is an all in one case and mount, and requires no additional components to attach your Pi to your Monitor or TV. This durable plastic raspberry pi case is a perfect fit for your Raspberry Pi 3/2 Model B and Raspberry Pi Model B +. This case comes with a Cooling Fan on top for your cooling needs. Open ventilation cooling sides provide extreme heat reduction. Raspberry Pi main board not included!!!! New and improved! The Flirc Raspberry Pi 3 case was designed to not only be functional for your Raspberry Pi, but to be drop dead gorgeous. It’s made of beautiful aluminum core that is sandwiched between two black, soft touch shells that feel amazing in your hands. But once it’s out of your hands, it’s deserving to be proudly on display running your favorite media center software! Note: We've redesigned Pibow to be compatible with both the Raspberry Pi 3, 2 and B+. Due to changes in the layout of the Raspberry Pi 3 older Pibows (one's with a 2/B+ label) will not work ideally with Raspberry Pi 3! Spice up your Flick Large board with a stylish white and orange Flick Large case! 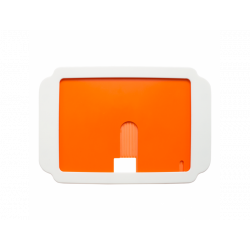 This vibrant and durable case is made up of two parts; an orange base and a slide-on white lid. This lid can be used in two different setups in either an open or closed position. This allows you to hide your I2C device and Flick Large, or keep it visible to the world. Flick works through materials such as acrylic, wood and glass so our plastic case (even when the lid is in the closed position) will not negatively impact any of the fun you can have with Flick! The Flick Large case features four suction cups for installation in the bottom four corners of the case. Use the suction cups to mount the case onto many different surfaces such as glass, plastic, or wood and still be removed easily. Perhaps you want to set up your Flick Large & I2C device to only allow entry through a door if you swipe the right pattern - with this case, you could mount it right next to the door without the need to drill any holes or hammer any nails. Visit our Flick GitHub page and acquire all the software you need to get up and running with your brand new Flick Large & Case. Spice up your Flick HAT and Raspberry Pi with a stylish white and orange Flick HAT case! This vibrant and durable case is made up of three parts; an orange base and a white two piece lid. This lid can be used in two different setups in either an open or closed position, allowing you to hide your Raspberry Pi and Flick HAT, or keep it visible to the world. Flick can work through materials such as acrylic, wood and glass so our plastic case (even when the lid is in the closed position) will not negatively impact any of the fun you can have with Flick! The Flick HAT case features two knockout holes which can be pushed out with a pen, allowing you to still access the GPIO with a short cable. Four suction cups come as standard. These can be installed on the bottom four corners of the case. The suction cups can be mounted on many different surfaces such as glass, plastic, or wood and still be removed easily. Perhaps you want to set up your Flick HAT & Raspberry Pi to only allow entry through a door if you swipe the right pattern - with this case, you could mount it right next to the door without the need to drill any holes or hammer any nails. Need help assembling your Flick HAT case with a Raspberry Pi? Check out our quick start and FAQ page here that will guide you through the process of piecing it together. Visit our Flick GitHub page and acquire all the software you need to get up and running with your brand new Flick HAT and case. 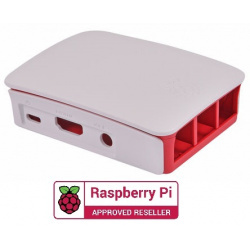 The Official Raspberry Pi Foundation's Raspberry Pi Case is now available! Specially made and beautifully crafted, this nifty and tactile snap-together case is designed to to protect both the Pi B+ and Pi 2 B! Side pieces can be individually removed to enable access to the GPIO, and the top can also be removed to enable the addition of HATs or other GPIO periphery! There's even LED lights pipes to top it all off!